Hello polish pals! 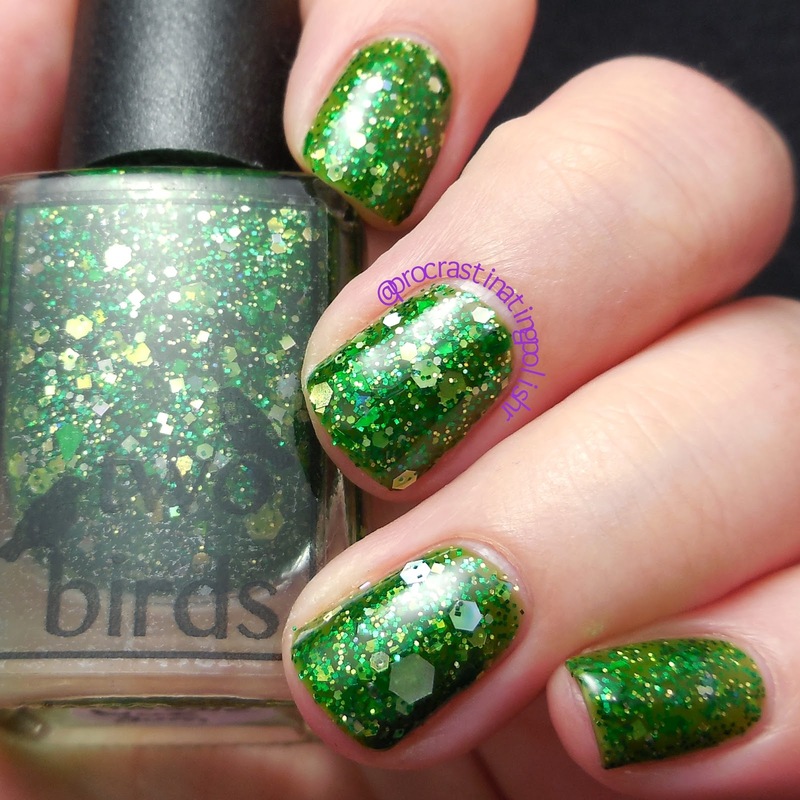 Monday is here, and with it is a stunning new collection from one of my favourite indie brands: Two Birds Lacquer. If you have ever read this blog before you will likely already know my love for this brand, and this time around I was lucky enough to be provided the whole new collection to swatch and review. The Floral State-ment collection is inspired by the floral emblems of each Australian state. 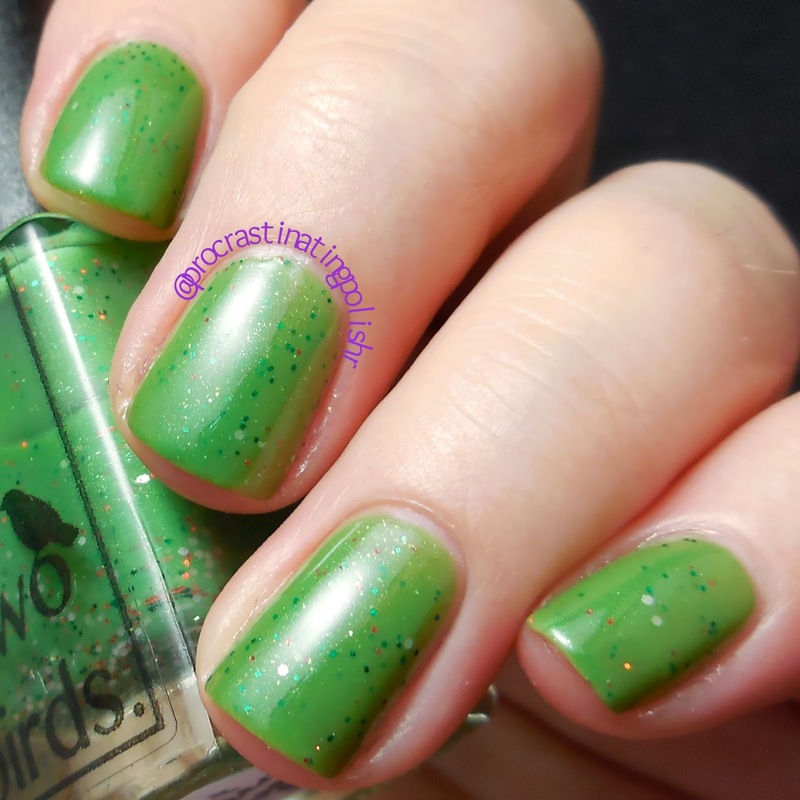 This has led to a really unique collection of both soft feminine shades and bold reds and greens in the usual high quality formula you get from Two Birds Lacquer. So let's check these beauties out! This squishy pink creme applies like a jelly and looks like some kind of delicious fairy floss creation. 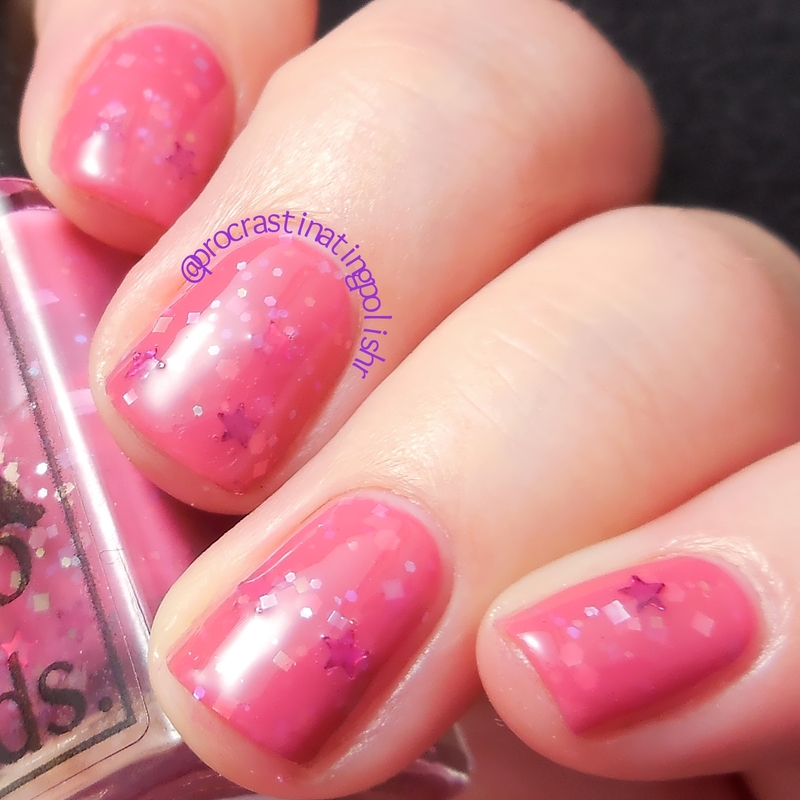 I used 3 coats to ensure it was opaque in the lightbox, but it definitely looked fine for normal day wear at 2.
some of the stars were stacked together, but an extra layer of top coat will keep it smooth if you find them on your nail. I don't know whether it's bias as a Queenslander, but this is a definite favourite. This is a nice sheer crelly that builds up in 3 coats to complete opacity. It can be worn at just 1 or 2 coats if you prefer a sheer look as there is no streakiness at all, a small miracle for an almost-white pale pink! 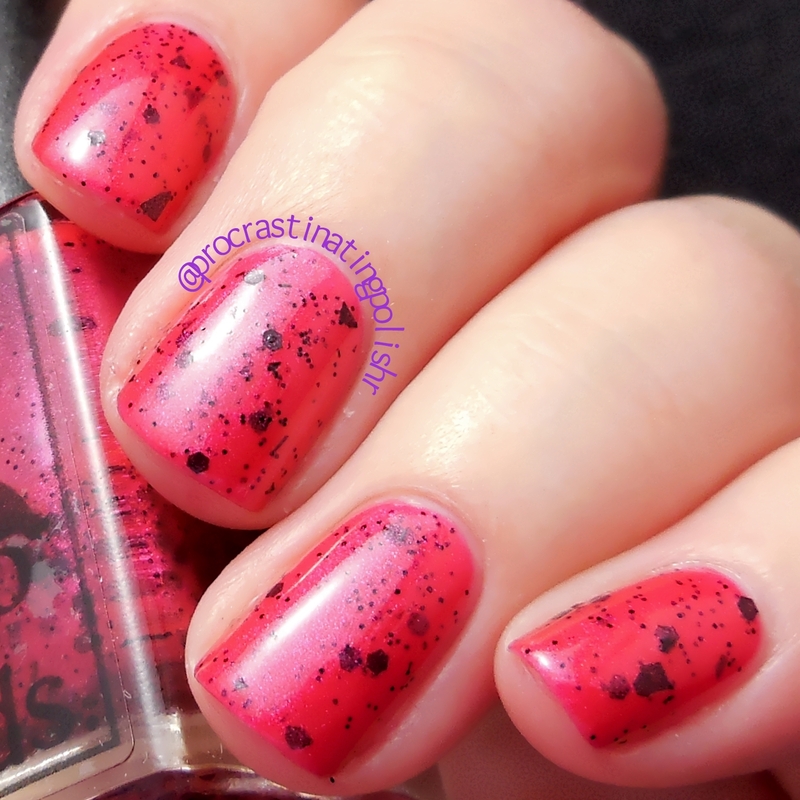 I adore the mix of glitters in this, the fuchsia dots and secret iridescent white glitters really make this polish sing. Again, application was easy with the glitters practically leaping out of the bottle and onto the nail. Due to the glitter density you do need to wait that extra minute between coats to avoid dragging, but what's an extra minute for this kind of beauty? I'm a green fanatic, so this was the first polish I tried. I was immediately impressed with the colour, a perfect grassy green that leans ever so slightly olive. This creme took only 2 coats to get a nice opacity, the formula ever so smooth with glitters that spread easily. It's impressive to get a green polish with red and white glitters that doesn't immediately scream Christmas! This definitely captures the incredible lush greens you see in nature, and the hints of fiery red and scattered white hexes are lovely. This milky white creme with its periwinkle and lilac glitters is like a lullaby, so soft and smooth with a beautiful calm palette. I'll admit, in the bottle I wasn't overly excited, but on the nail I was enamoured. This is by far my favourite soft shade in the collection. Royal Bluebell is another sheer creme that builds to opacity in 3 coats - but could be layered with one coat over white, or worn like a crelly. It is worth waiting between coats to avoid dragging the stars around. I didn't find any sticky stars in this bottle though - only one layer of topcoat sealed this up well, possibly because the stars are slightly smaller than those I've come across before. Ooh I love me some red and black! Definitely a winning combination in my book. I love the mix of micro, hex and shard glitters and they are distributed well in the base. This is an easy two coater, but I did a very thin third for the camera. Also worth noting that this is one of very few pearlescent polishes that I completely adore - having the blue tinged sheen when it catches the light brings a whole new dimension to the bold red and black and it works perfectly. This one is sure to please those who like a really feminine french pink. I layered this with 4 coats to reach a solid opacity but, much like Cooktown Orchid, if you like it sheer this one can easily be worn that way. I did find that the formula was a little thin, meaning I had to sit this one upside down for a bit before using - those lovely big hexes and triangles had to be coaxed out. It isn't so thin it makes application difficult, it actually applies really easily. Definitely a must have for pink fans. Green glitter bomb! What a perfect encapsulation of the mighty Tasmanian Blue Gum. Green and gold micro glitters swim in a green jelly base, with a healthy dose of green, white and gold hexes in varied sizes. Some of them pick up the light and flash hints of blue, much to my eternal delight. As a jelly fanatic and a green lover, this is a total dream polish for me. 3 coats - 2 regular, and a final dabbed one for optimum glitter - was perfection on my finger tips. Layer it over black for something slightly more subdued, or a matching vibrant green creme for a more solid look. Oh yeah, 2 coats. TWO COATS! Yes I am a very bad blogger, recycling my own photo. This was previously shown to you as a prototype glitter which has now been released in the Floral State-ment collection! Which is very good news for you all, because it's a beauty. This has those same golden flakes you see in Waratah, as well as gold micro glitter in a clear base. 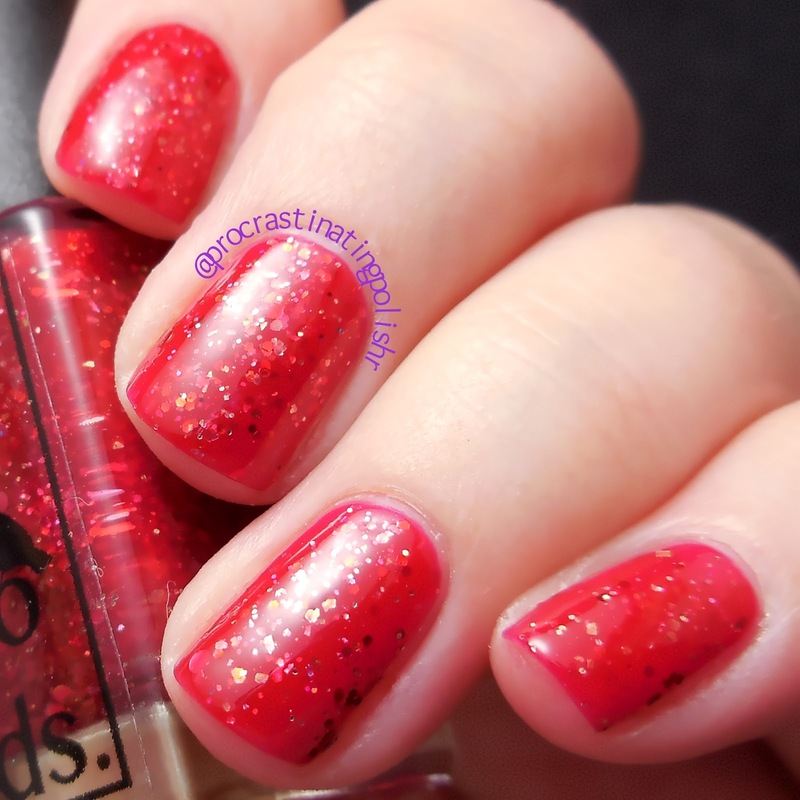 The one I tried a little while ago I preferred as a glitter topper as it was slightly patchy at 3 coats alone. Honestly I think just because of those beautiful flakes it works better as a topper, as they stand out when the application is a bit more sparse. 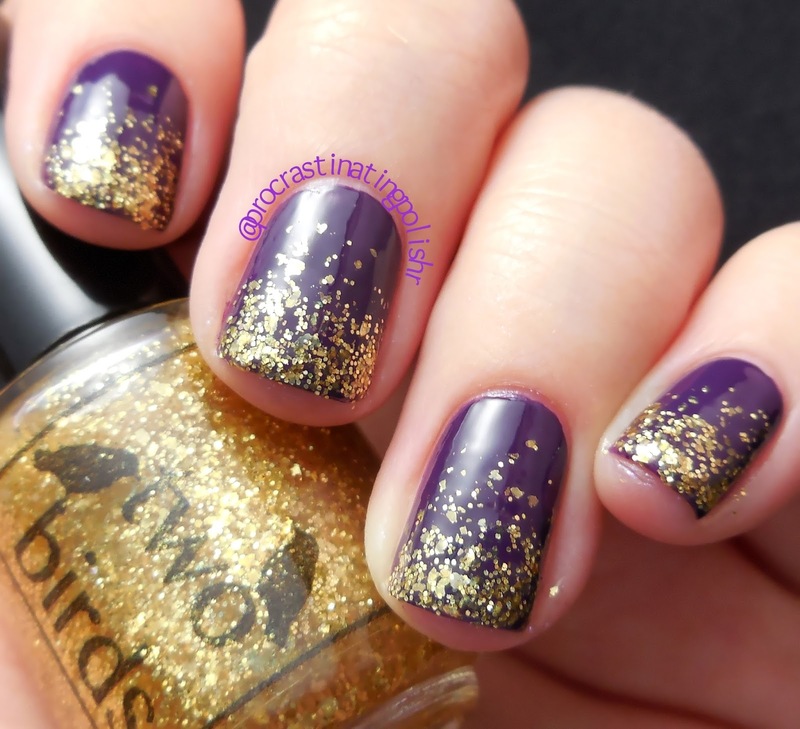 Stacey has noted in the product listing that this can be worn as a full coverage polish as well, so good news for those who want a golden glitter frenzy on their nails! Unique, interesting collection with great formula and something for just about everyone. Floral State-ment is available NOW at the Two Birds Lacquer Etsy store! *The abovementioned products were provided by Two Birds Lacquer for review, which in no way affected my opinion of the product. Please refer to my Disclosure page for more information.